The ribbon of smooth asphalt next door to our friend’s rustic lake cabin stretches the equivalent of about two small city blocks. The absentee owner of this vacation cottage thinks of it as hisdriveway. My kids and I know it to be ourrunway. On either side, the boughs of tall, white pines meet overhead to form a perfumed, shady tunnel. Forty years of natural pine needle compost have resulted in the slow, steady buildup of soft, cushiony brown shoulders on either side of the little drag-way. The combination of shade, pot-hole-free pavement, and wide, soft shoulders (along with the owner’s absence) makes this stretch of driveway the perfect setting for a kindergartener to learn how to ride a bike. Many Labor Days ago, Lizzie’s pink and white Walmart Special called out to me as I packed her older brother and sister’s bikes. “Take me on your camping trip! Take me! Now’s the time for Lizzie to learn how to ride!” I reluctantly complied. Teaching a small child the art of two-wheeled locomotion on a camping vacation began with the necessity of daddy putting down his long-necked beverage, and usually ended with daddy nursing a sore back. Odds for scrapes, bruises, and tears are better than fifty-fifty. And for a daddy who loves to ride, success means several years of excruciatingly slow bike rides until the new rider graduates into longer legs and larger wheels. But there was no arguing with the convincing logic of Lizzie’s little bike. If I didn’t act soon, she would soon outgrow her miniature pink and white steed. The time to act was now. 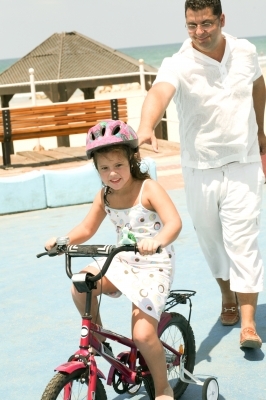 On the Labor Day of her Kindergarten year, Lizzie donned her pink helmet. “Daddy, today could be the day,” she proclaimed, as she mounted her pimped out ride. A pair of pink and gray, Oliver Twist-style, fingerless biking gloves picked up the colors of her hat, bike, fingernail polish and necklace. Like everything else, Lizzie was going to place her own unique stamp over the top of this exciting new chapter in her life. Sure enough, bending over and holding up a bike, while running as fast as I could, led to the anticipated backache far earlier than I had remembered. A gravy stain of sweat began forming over the top of my middle-aged abdomen earlier than years past. Maintaining an air of excited anticipation required more energy than previous episodes of bike instruction. But just as I felt myself running out of gas, an insight showed up along with my second wind. Right around six years before this driveway moment, a mixture of biology and discernment led Lisa and me to the conclusion that Lizzie would be the final, sweet fruit at the end of our branch of the family tree. As I huffed and puffed, it occurred to me that this would be the last of my children that I would teach to ride a bike. Immediately, I became aware of a small welling up of something like grief. But strangely, with the sadness came a sweetness. What, at first, felt like a painful chore, was transformed into a privilege beyond words. This Sunday’s Gospel passage (Mark 8: 27-35) catalogued a famous conversation between Peter and the Jesus. In that brief dialogue, Peter bristled against Jesus’ forecast that he would, one day experience pain, rejection, and death. Perhaps he thought that Jesus was too powerful, or too clever to endure suffering? Jesus’ response (He called Peter, “Satan.”) was so strong that the reader was left to wonder if Peter had tapped into one of the lingering temptations left over from earlier days of fasting in the desert (Mark 1:13). Jesus, for his part, made it quite clear that he would not try to wiggle out of this dimension of human existence (i.e. suffering). But in small and large ways, the cross, and the grief that attends it, are woven into even the most unexpected aspects of our lives. Even something so joyful as a child’s proper development brings with it the unexpected suffering of letting go of a beloved child, or a beloved chapter of life. Nine Labor Days ago, I let go of a bicycle, and a daughter rode on without me for a few feet. I heard my mouth jubilantly proclaim, “In America, you know what we call that?” She yelled back, “Riding a bike!” “That’s right honey…riding a bike!” Inside, I could see her riding beyond that little driveway, up the lane, and off into a future, down roads beyond my imagining. Something occurred to me, standing on that sacred little patch of asphalt. Acknowledging, and accepting the natural grieving that comes with living, has a way of making life more precious.